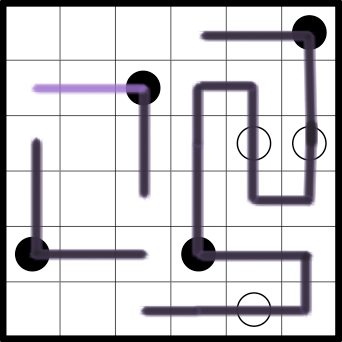 Masyu puzzles are elegant logic puzzles that don't use numbers as clues. 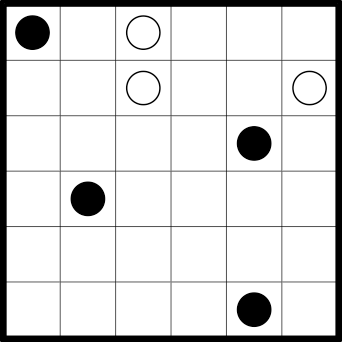 Instead, the clues are simple white and black circles that resemble pearls. 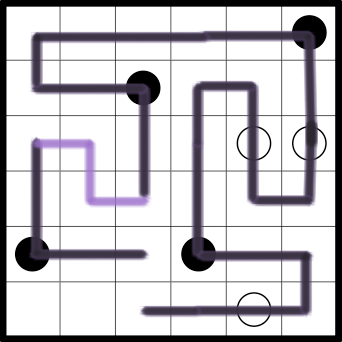 Like Slitherlink puzzles, you will be using the clues to construct a loop or circuit. The loop is made up of little straight line segments. Each line segment is either horizontal or vertical, and connects the centers of two adjacent cells. The finished loop will never touch itself, or cross itself. The black circled boxes indicate corners (turns) - the line will make a 90 degree turn on the black circle. Each black circled box must be preceded and followed by a straight box - the path must travel straight through both the previous and the next boxes in the path. The white circled boxes indicate straights - the line will go straight through that box without turning. 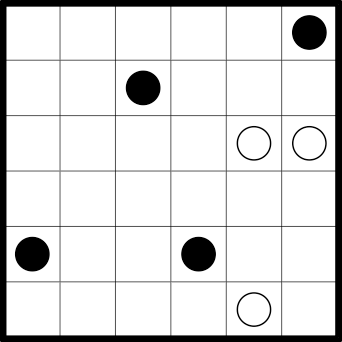 Each white circle must be adjacent to at least one corner box. 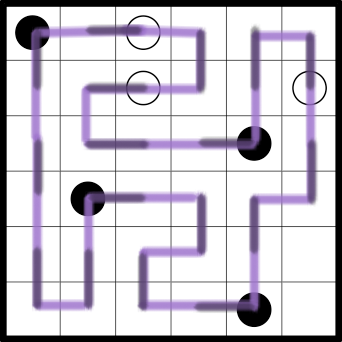 The loop must make a turn in either the previous box or the following box, or both. Let's solve this puzzle together. If you'd like to follow along, this is from Easy 6x6 Masyu, Book 1 of my collection. In fact, every black circle that are within 1 cell of the border can be fully or partially filled out. 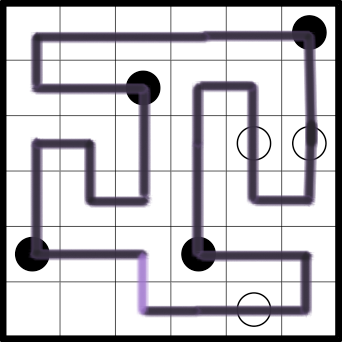 We can now extend the path leading from the white circle on the upper right. Since there is a straight leading into it, the path leading out of it must have a corner immediately, otherwise it would not be a valid white circle. Remember all white circles must have at least one adjacent corner. We can now fill in a straight on the innermost white circle - the path that we've already drawn forms a boundary which we cannot cross in any other way. There are now a few spots where we can extend the path because we have no where else to go. The path is forced in these areas. We can now extend the remaining black circle, because the remaining directions for the corner aren't available. 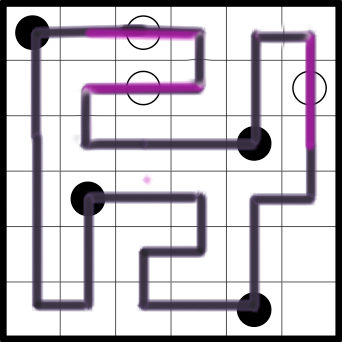 The path on the upper left of the puzzle is now forced. The path on the left side is now forced. And the remaining piece is forced. And we have now completed our puzzle! 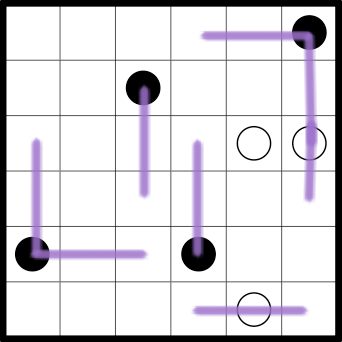 If you found this tutorial challenging to follow, try a few more of the easy puzzles. Otherwise, go ahead and try the hard puzzles. On the hard puzzles, the principles are the same, but the forces can be a little harder to spot. Here is my complete Masyu collection.